I’ve been pretty much absent from blog-land for the past week or so. I wasn’t away, but I had a four days off work between the holiday, a vacation day, and the weekend, and I wasn’t on the computer a whole lot. It’s the Kirsten Kimono Tee from MariaDenmark. 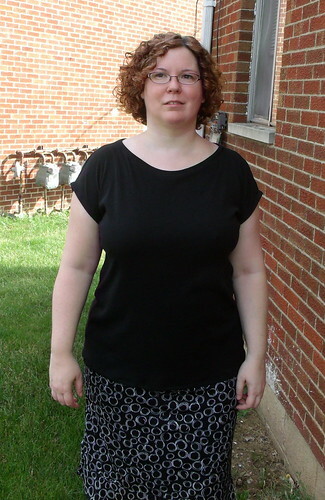 It’s a free pattern, and it was so fantastic that I already bought a copy of her day-to-night drape top pattern. It’s not 100% done yet, actually. I made it a little big, so I want to take up the hem probably about an inch and a half and maybe take in the waist some, too. I’ve got to start picking pattern sizes based on high bust measurement and learn to do a full bust adjustment. It’d be less work in the end than making a too-big size to fit my bust and then having to adjust everything else. Oh, and I’m going to embroider these owls across the front in light/bright colors. I love those owls to death. I bought the pattern when Urban Threads was having a 50% off sale a while back with the intention of putting it on a t-shirt, but I haven’t been able to find just the right t-shirt until I made this one and realized that was exactly what I wanted to do with it. Even though I need to do some alterations, that didn’t stop me from wearing it for the rest of the afternoon and evening, and it’s by far the most comfortable t-shirt I’ve ever owned. The fabric’s a bit softer and nicer than regular t-shirt fabric, and I think the kimono sleeves make it even comfier since there aren’t as many seams. I made the shirt sort of on a whim — I saw a link to the pattern in one of my Ravelry groups, which reminded me that I’d been planning to try it when I got brave enough, and I remembered that I had about a yard of black jersey that I’d bought to line a bag with but ended up using a woven instead, so I printed it out and had at it the next day. It was a pretty quick project considering that I sew pretty slowly, took about 3.5 hours including printing it out, taping the pages together and cutting the pattern out. Oh, and consulting the internets and a couple of books to figure out how lay out the fabric so the grain on the bottom layer wouldn’t be all crazy and wrong. I ended up following one rib all the way down with blue painter’s tape to make sure the fold was on-grain, which might possibly be the most time-consuming way to go about it but at least I knew the grain was straight. (Next time I’m going to try running a long basting stitch, which sounds a lot faster.) Then I just smoothed out both layers and hoped for the best. 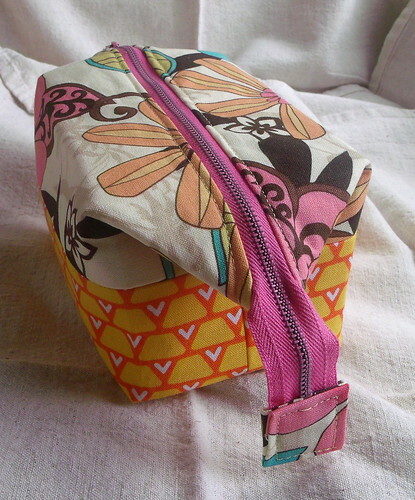 I also recently made a little zipper pouch using the Noodlehead wide open mouth pouch tutorial. I made this one a bit smaller than the smallest size on the size chart, same height but all the pieces and the zipper were 9″ rather than 10″ because I wanted to use that flowerdy fabric but only had scraps of it left. 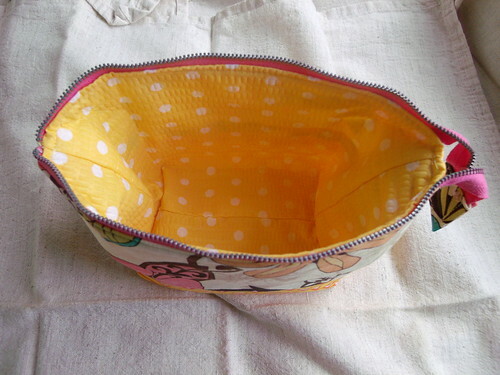 I decided to interface the lining as well as the outer pieces since the lining fabric was very light weight. I was concerned that those fabrics would be sort of unpleasantly clashy together, but they seem to work. I have a hard time with pink — I’m not particularly crazy about it, and I’m never sure what goes with it. But my sister-in-law loved it, and since it was for her that was all that mattered. It’s further on than that now. I’ve got all the hardware attached except the half of the side release buckle that goes on the flap. Most of the topstitching to attach everything together is done, but I need to rip out about 4″ along the back and redo it because it’s a mess and didn’t catch the lining, only the outer bag and the flap. The wide webbing in the picture has been assembled into a long adjustable/removable strap with the snap buckles on either end (they’ll attach onto the sides at those anchors). 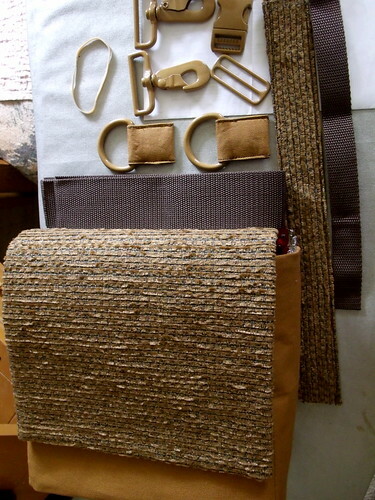 There’s also a shorter handle-type strap (on the right) made out of the bag fabric, and that’s proving to be the biggest challenge. I had it basted into place before topstitching all the layers together, but I couldn’t fit it all under the presser foot since that strap inserts between the lining and outer bag at the same spot where the anchors for the long strap are attached to the outside. (Did that make any sense at all?) So I took it out and topstiched everything but where the anchors are, and I’ll hand stitch those parts with a double strand of upholstery thread and one of those fierce-looking needles that come in an upholstery repair set. Oh, and since I’m cheating and figuring out what I haven’t written about by checking my Flickr photostream, how about I wrap this up with a photo of Loco since he hasn’t made an appearance here yet? Ain’t he pretty? 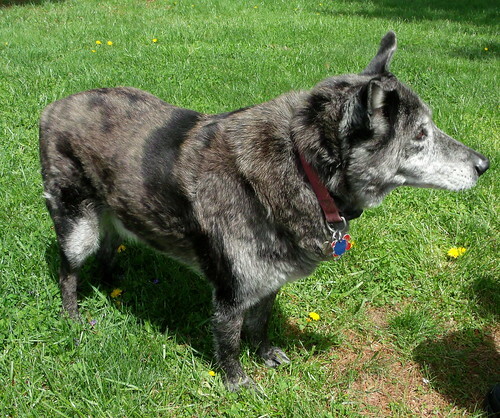 He’s part elkhound and part cattle dog, and when he’s not muddy from wading in the creek his paws are mostly white. People are always asking if he’s part wolf. I don’t really see it at all, except that his coloring is a little unusual. And if you see him straight on, he has that adorable slightly dingo-looking face that cattle dogs have. He’s 13 years old now, but you wouldn’t know it to watch him most of the time except first thing in the morning before his arthritis medicine, or if he’s had an unusually active day and is tired out. He’s camera shy, pretty much takes off whenever he sees me with the camera, so I don’t have tons of photos of him and decided to sneak a few at the park not long ago.